This year, Concordia has added one new major, one new minor and two new concentrations to the mix. The new major is heritage and museum studies, data and analytics is now being offered as a minor and business majors may now add a concentration in agribusiness or finance. Finance has been added as a concentration due to its high demand. After extensive research, Christopher Mason, associate professor of finance, said the department saw the need to increase finance as an option for students. Collins delves into the books of her new major, heritage and museum studies. Photo by Maddie Malat. Agribusiness has become a concentration due to its prevalence in the Fargo-Moorhead area, according to Mason. As of now, three students have declared a business major with a concentration in agribusiness, seven have declared a data and analytics minor, seven have declared a concentration in finance and 12 have declared a heritage and museum studies major, Ericka Peterson, registrar employee, said. 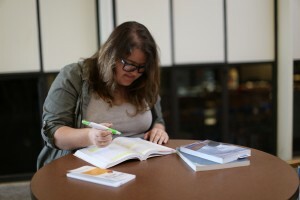 Annalise Savageau is a sophomore who has declared a minor in data and analytics. Savageau found out about this minor from her advisor, Dr. John Reber, who teaches many of the courses she will need for this minor. After looking into it, she decided it looked like something she would like to try. “There are good reasons to believe that a minor in data analytics will be successful, mainly due to the combination of student demand and evidence that we can do analytics as well as anyone, judging by Concordia winning the Midwest Undergraduate Data Analytics competition two years running,” Reber said in an email interview. “It pairs really well with a math major so if you’re interested in statistics, it’s a good way to go,” Savageau said. Jenna Collins is a senior who has decided to declare a heritage and museum studies major, due to its optimal pairing with her history major. “It fits perfectly into what I want to do,” Collins said. Collins said her goal after school is to work in a museum either doing archives or collection. After she graduates from Concordia this spring, her plan is to either go ahead with graduate school or to find a job in the field and plan for graduate school in the future. A heritage and museums studies major could assist in becoming a curator, a collections manager, working in archives, in restoration, in archeology and more, according to Collins. Collins recommends this major to anyone interested in working with museums or public history. “The heritage and museums studies major is a collaboration of classics, art and history,” she said. Examples of classes Collins is taking to fulfill her new major are museum studies one, classical archeology, digital humanities, a classics elective and an art history course. Fitting a new major into Collins’ schedule as a senior was not as difficult as one might think. When the new major was announced in January, she sat down with Dr. Joy Lintelman, chair of the history department and they figured out whether or not they could make it work. They figured out the classes could fit because of overlap with her history major. The number of new majors or minors changes each year. Generally, it is more common to change existing majors or minors than to propose new ones. The amount of new offerings this year is higher than usual, Peterson said. “Most of the majors and minors that are proposed are approved,” Peterson said. These new additions were each proposed last year. To add a major or make a change, the proposal has to be passed through the Curriculum Committee, Faculty Executive Committee and onto Faculty Senate who makes the final approval. If students want to declare any of these new offerings, Peterson directs them to the registrar webpage, which will allow them to fill out information and make the change.